"Confidence soars as she courageously enters the magical world of the stage!" 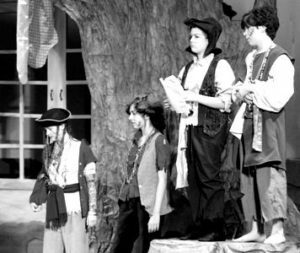 Our unique approach to dramatic arts is based on improvisational play. Our brilliant teachers know how to tip the artist off balance just enough for him to forget about self doubt and jump in! Once there, in the moment, the artist never quite recovers from the rush! How fun! How fabulous! What calm confidence and clarity ensue! SAA is known for delivering high quality productions. Our Year End Performances are far more than a typical recital! At SAA the artist is part of the story, creating a beautiful collaboration of dance and dramatic arts that thrills audiences and inspires the artist. The roar of the crowd and smell of grease paint continues throughout the year with our sister, non-profit company Suwanee Performing Arts (SPA). Through organizations like Suwanee Ballet as well as Community Art Players of Suwanee and events like Broadway in the Park, the artist finds ample opportunity to perform! Rest assured that as a part of our SAA family you will always be in the loop as opportunities arise! The dramatic arts have a way of building confidence and connection, creating strong bonds of friendship that will never be forgotten. We value these bonds in our SAA family and we nurture and encourage those friendships in and outside of the classrooms. From the moment you enter you will feel embraced and welcomed. Our entire teaching staff shares our love for each individual artist and we place her guidance and care as a top priority. We invite you into our supportive family and encourage you to share your talents too! Music from great Classical composers like Beethoven and Mozart invoke characteristics of harmony, clarity, restraint and idealism. Our Classical level artist clarifies her dreams and discovers how to let go; creating art while working in harmony with others.